KobaP has been dropping some vague hints about news later today. I don't know whether it has anything to do with Sengoku Basara at all - his past hints have ranged from 'a new game is about to be introduced' to 'I'm going to retweet some cute comment from one of my friends' so it really could be anything, and he produces several different game series. Still, teasing keeps things interesting. Here are some actual news updates for now in case the hints turn out to be nothing after all. 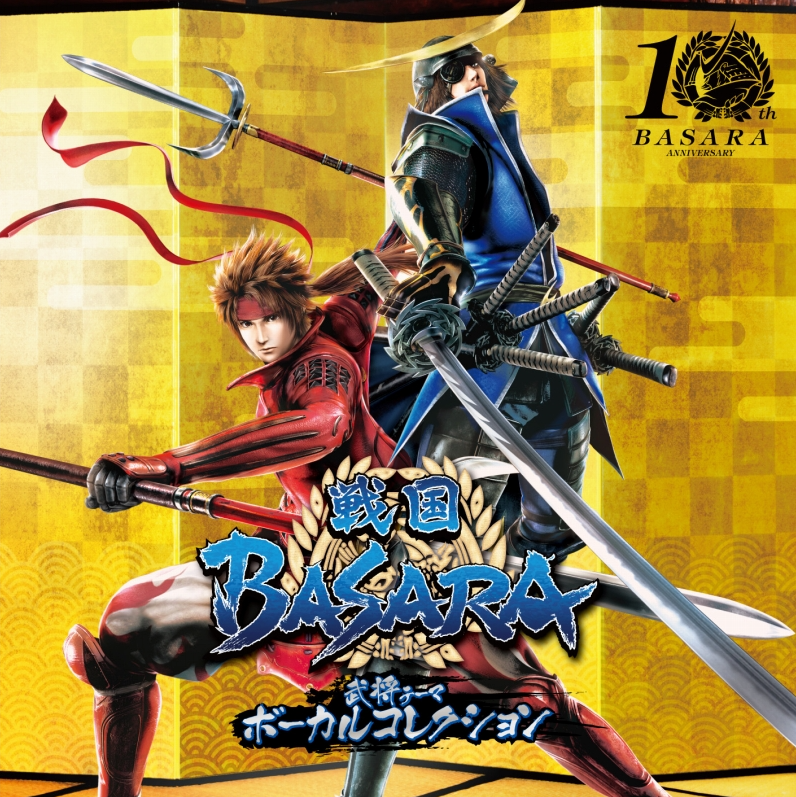 We now have the cover artwork for January's Sengoku Basara 10th Anniversary Warrior Themes Vocal Collection CD. A note adds that one of twelve (randomly-selected) trading cards will be included in each pack. In addition, they have confirmed the videos included with the CD+DVD version. As previously hinted the DVD will include a special 'Sengoku Basara 10th Anniversary' movie and promotional clips from Sengoku Basara, Sengoku Basara 2, Sengoku Basara 2 Eiyuu Gaiden (Heroes), Sengoku Basara X (Cross), Sengoku Basara Battle Heroes, Sengoku Basara 3, Sengoku Basara Chronicle Heroes, Sengoku Basara 3 Utage, Sengoku Basara HD Collection, Sengoku Basara 4 and Sengoku Basara 4 Sumeragi. 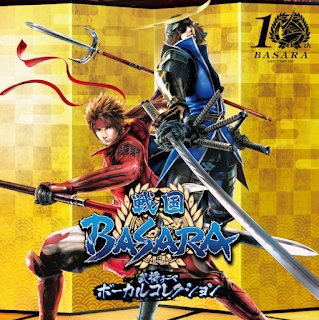 Speaking of CDs and cover artwork, the series' anniversary website has confirmed the cover for the Drama Yose CD Sengoku Basara -Date Masamune & Sanada Yukimura- disc which will be released in January. The preview includes a sample image of the first volume's Animate-exclusive keychain. Ten of the series' most popular characters are the focus of this range of 40mm pixel art acrylic keychains which will be exclusive to the Animega chain of shops. The keychains should now be available for ¥500 each online and from stores (the official release date was 12th December 2015). There have been two new Ashigaru-kun reports this week; one from the Capcom Bar to accompany the previous post and another from the recent Sengoku Basara Qualification exams. The Capcom Bar report simply summarises all of the other new dishes with short explanations about their inspirations from the bar's manager. The exam report transcribes a moment from the official audio announcements before the test, which featured Nakai Kazuya (Date Masamune) and Souichirou Hoshi (Sanada Yukimura) acting in character. It sounds as though it would have been worth going just to experience that, if it wasn't so far away and difficult to attend for those of us outside Japan. Yukimura's loud, over-excited personality probably put the test candidates in a very strange mood! For fun they also include a few sample questions from the first part of the test. Sengoku Basara: Which of these does Uesugi Kenshin worship? Xavi, Fudou Myouou (Acala), Bishamonten or Christianity? Sengoku Basara 3: With which power is Tokugawa Ieyasu trying to unite Japan? Money, weaponry, bonds or magic? Sengoku Basara 4/Sumeragi: When Gotou Matabee uses his special move Gyakujou Yuuge No Rougoku, what kind of elemental effect does the finisher have? Fire, lightning, kuudere or every element? The description of the second phase included more in-character announcements and more sample questions. 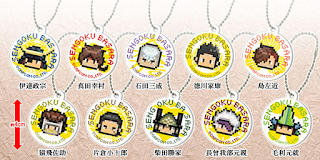 Sengoku Basara: Which of the following items gives a bonus to one particular character? Fourth Paddle, Blue Dragon Blade, Air Cannon, Forgot My Hammer! Sengoku Basara 3/Utage: When Mitsunari equips his personal item, which of his special moves can be used with no time limit? Danzai, Kyoukou, Godbless or Messatsu Jigokusha? Sengoku Basara 4/Sumeragi: Which of these is the correct line Yukimura speaks when he unleashes a Basara move when Maximum Style status is in effect? This question was presented as a listening problem so the candidates heard Yukimura speak each line. They were all similar except for a change in whether Yukimura started off by yelling 'Burn out! ', 'Hot-blooded Eruption! ', 'Burn, spears; roar, blazing explosion!' or 'Get hot!'. 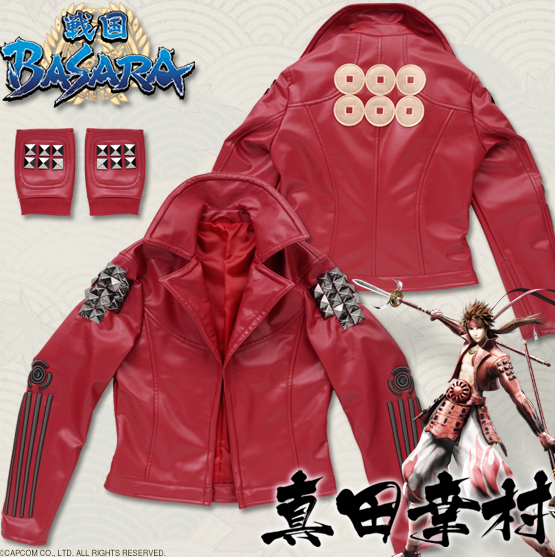 If you have money to spare and want an unusual Yukimura-related item for your wardrobe, the third round of preorders have opened for the deluxe Yukimura jacket (with gloves) from Premium Bandai. The ¥100,000 price tag is unchanged. Preorders must be made before 12th January 2016 and the clothing will then be delivered in February.